Humans are impatient worriers. On the high side, it means we care but we want to know everything immediately. Perhaps a predator way of thinking; we’re always on the hunt, stalking the perceptions that elude us. The more we chase, the more understanding hides. We crave control and we’re better at fighting than waiting. Gaining a depth of understanding takes vulnerable self-examination and as much time as it takes. We lose some balance, running the no man’s land between trying to not demand an outcome and giving up needing one. Because we think too much, we have no solid footing but in affirmative training, there we are, always trying to get horses to do what we want, worried that we are not important to them. Sometimes we think so hard that we can’t breathe. We’re listening for calming signals, the body language of horses. The term is deceptive. With our predatory desire to control things, we hope it means there is a signal, maybe a hand sign or a verbal cue, that calms a horse like holding a chicken upside down. Can you imagine how rich I would be if I could teach that? There are trainers who lay claim to that technique, but to great damage to the will of the horse. Listening is what we do when we choose to question our predatory nature. We owe so much to dogs and their people. All of our insights into calming signals started in the dog world with Turid Rugaas’ book, On Talking Terms with Dogs: Calming Signals, and they are ahead of us still. To our credit, horses do require a bit more from us than a dog. Our feet must let loose of the ground. Riding is an equine trapeze act: We fly in the air between strides, trusting horses to catch us. A defensive rider will kill the horse’s crucial rhythm, so we surrender to the gait and try to find the power in letting go and listening. Affirmative training is counterintuitive, we show strength by the actions we don’t take. We’re mental. Horses are experiential. When they greet us by sniffing our hands, we’re certain they’re seeking some magical bond, but what if they’re just curious about a smell on our gloves? Listening is the dynamic action of taking ourselves out of our over-controlling mind and into the realm of our senses. Horses communicate their anxiety, their Calming Signals, in a couple of ways. Appeasement behavior is directed at another; One seeks to pacify the aggression of another by taking an inferior or submissive stance, such as foals champing around adult horses. “I’m not hurting you, please don’t hurt me.” When we are fast or loud, we might get this sort of answer. Displacement behavior is self-directed or away from the other; Such as nose rubbing, lick-and-chew, or yawning, displayed when there’s a mental conflict about how to proceed. “I feel anxiety, I’m uncomfortable.” This type is harder to read. He’s curious about what’s ahead but nervous to leave the group. He wants to please but is cautious about the bridge. He’s weighing the sides, he needs time to think and make a choice. Horses are ambivalent. Ambivalence is a confusing word. I thought it was a kind of apathy, but it’s actually a call to action. That changes everything. Ambivalence is defined as having mixed feelings or contradictory ideas about something or someone. Synonyms include: uncertain, unsure, doubtful, indecisive, irresolute, in two minds, undecided, unresolved, in a dilemma, on the horns of a dilemma, in a quandary, on the fence, contradictory, clashing; confused, muddled, vague, hazy, unclear, blowing hot and cold. Horses might give a calming signal because they need a minute to consider their options, and when the definition of ambivalence is right there, it’s easier to understand their situation, isn’t it? A horse needs time to take a cue because this is the cusp of confidence. They’re on the brink of mental overwhelm and it can go either way. If we take a breath here, it cues the same for him. A horse that reasons his options and thinks is a partner; a horse who’s careful gets fewer injuries and becomes trustworthy. But it’s natural for predators like us to push. We want to control the outcome, but did you have an emotional reaction to the list of ambivalence synonyms? Was it easy to relate to the awkwardness? Of course, because the learning process makes humans ambivalent, too. In our attempt to understand, we worry that we ask too much or too little or just the wrong way. We worry the horse is distracted or confused and then we become distracted and confused. It’s the ambivalent leading the ambivalent. Perhaps understanding what’s at stake for the horse will give our predatory thinking something more to chew on, as we pause to acknowledge our own uncomfortable ambivalence. Breathing through it is the miracle cure. It calms our own anxiety while giving the horse time to earn the confidence of choice. We must find a way to let those moments of uncertainty and decision making run their course without correction. When we hurry a horse to a cue, we’re telling him to not reason it out, but instead, surrender as a prey animal to our superior predator intellect. Will that encourage him to confidently volunteer his best effort? Listening with patience is a hard skill to embrace, especially for a human who wants to resolve their own anxiety, but recognizing that feeling in ourselves can give us a chance to show some grace, to the horse as well as ourselves. Indeed, calming signals are more complex and important than any hand signal or voice cue. It’s the actual stuff that trust and reliability are made of. Is it necessary to understand each calming signal a horse gives or is it enough to not increase their anxiety by adding our own? What if it was okay for now if both of you are confused but willing to try? About now you might remember to breathe, but it’s hard to do. Mindful breathing means we let the discomfort hang in the air, that we allow someone else the option of resolving the question. If we let go of our predator control, can a horse release some of his prey anxiety? Could mutual calming signals be a conversational path to trust? Join us at annablake.com and on Facebook. I had to take an interval to read this perfect piece. Thank you for reminding us of the importance of ‘grace’. Recently, I have been doing just that with my OTTB: This wonderful boy works from voice, about 99%. Therefore, if I say “Half Halt” — while also performing a very light half halt — he knows it’s time for the change of pace. I recently introduced a ‘deep breath’ after the announcement of ‘half halt’. I take a deep breath, breathe out, give him a few moments, then proceed slowly at first, into the new gait. This has had amazing results, and I often find he takes a deep breath with or after me. With our hectic schedules, and you have often alluded to that subject before, it’s sometimes difficult to calm ourselves before arriving at the barn and before riding. Yet, it is the single most important factor to create a calm environment between ourselves and our horses, to let them know we are there for them, we are happy within our hearts and our souls to be there, beside them. I see too many younger riders (teens, twenties), rushing through the ride or training, walking around the arena, scanning their cell phones while mounted. Please put the phones down, or tuck them away. BE with your horse. BE with yourself and your horse. And yes, b-r-e-a-t-h-e, before, during, after the ride. Take a deep breath when you dismount, and say, “Thank you for the honor of the ride,” with some gentle rubs. He will know what you mean. Hi Anna, and welcome back. You, and all of us, will profit from your little spell. Such sublime writing. I read it through, then again and made notes. You keep coming back to the breath, also sniffing and scenting. I know for sure horses can track like a dog, as it happened one day when I lost a riding partner in a forest, and my mare put her nose to the ground to decide which track to follow. One day, out droving, I’d dismounted. When I rode off, same mare went about 15 yards and then refused to go further, most odd behaviour for her, camp, horse herd, and cattle all ahead, we were tailing, riding drag. I gave her her head and she turned and walked back to stand over my greenhide (rawhide) stock whip, which I’d forgotten to pick up. She valued my whip? But she’d smelled it out. If fear has a smell, then they know that too, and fear creates mistrust. Trust must be mutual. They sniff to find out things, like my favourite alpaca pullover, every horse that spots it has to literally bury its nose into it, saying “What is this?”. They know wool, but this has a different animal smell. Breathe? Adrenaline requires oxygen, but when we get a scare we gasp and hold our breath. The horse does the same. Then we hear the sigh, the moment the horse has come to terms with whatever, and we know all is ok. I love that big sigh. To the final two questions, the answer is “Yes”. The question is motive, avarice or love? Why do we do this? For the accolades in competition? Or because we love relating to them, the oneness of total and mutual trust? I’ve long moved away from “you must” into “may we?” I deeply value what I learned as a kid in the show rings, but educated my youngsters out on the trail, where a horse learns to “get real”. Anna, I think this is about the best you’ve written, and I thank you. Thanks, Louise. (And there was a bit of a bump going to the new website but most of us are back now.) I think it’s taken me a long while to recognize that a Type A mentality is predatory… but I think that’s the old method we started in. Great comment, it is all about smell. I always apologize to people whose dogs don’t listen to them around me, but I always have a little llama odor on me! Anna! This is so perfect! But most of your insights are. You are a gifted, blessed woman and ?pI can only hope to ever be half as insightful as you. Thank you for sharing your wisdom yet again. Thanks, Jeannetta. That insight is gained by getting it sideways more than a few times! Coming across this article couldn’t have come at a better time to my life. I am struggling with anxiety which l believe led to a recent diagnosis of high blood pressure. I am devasted as I take pride in an active lifestyle and healthy eating habits. After reading this I will take another approach at the barn and try to apply in life as well. I am so very thankful for your insight. Life is interesting, isn’t it? Control is futile, and sometimes 1+1= another thing entirely. Thanks, Caroline, for reading and commenting. Amen, Carol. The long ears require a bit more from us and we’re better for it. Great comment. What a wonderful way of relating to others, animals especially. I want to learn more. Peace! This week I met two donkeys in a paddock. They were at the far end, quietly watching me photographing the landscape. Eventually one decidedly walked over to sniff me and say hello. Very gentle but Fred didn’t want to greet it. After a while the other one came over and immediately Fred was excited and much mutual exchange took place. I was left wondering…. We’d both be there shaking our heads and wondering… but it would be fun to wonder, Annie. Thanks again, Anna for the beautifully expressed, enlightening, and inspiring words. Recently, I had a light bulb moment, which was – to not try harder, but instead, to try softer. already vastly reduced from previous levels – was still counting against the flow of communication and relaxed relating between me and my horses. The “try softer” approach is working a treat. We now have more quality time for greeting each other, catching up with the latest news, looking around at the goings on, and, then, when the time comes to focus on our work, I have so much more relaxed and present horses. Could it possibly be because they have a so-much-more-relaxed-and-present human being !?! The most simple phrase: Less is More. The most counterintuitive idea ever!! Good for you, Lauri-anne, and nah, I’m sure it’s a total coincidence, :). “Gaining a depth of understanding takes vulnerable self-examination and as much time as it takes.” Love that sentiment … though that is likely why I have more success in relationships with horses than those with humans. I love taking the time to hear their answer, and trying to find that mutual path to whatever “success” is … but our culture (both horsey and not) far more favors what you describe as the predatory approach to things. Extroversion, speed, and results are what is valued. Another great piece, Anna! Great comment, Lia. I think I needed horses to train me up so I could even approach humans…. Glorious, wise ambivalence! Thank you horses and thank you Anna. OMG. Just yesterday I was despairing at my lack of patience and this article had me in the first paragraph. It is brilliant! thank you so much Anna for you amazing writings. You’re welcome, Stephen. Nice hearing from you! I always thought that a “lick and chew” meant that the horse has processed -or at least is mulling over- what is being asked of her. That, and yawning, are considered a release of tension in body work. I am especially concerned as my mare often yawns as I am tacking her up. She doesn’t seem stressed and happily stands for me to mount. But I did wonder if she was releasing the tension of anticipating the ride. Calming signals have nuance, different horses express differently, and pain has to be the first thing we check for. Many signals, like licking and chewing, happen in relation to physiological changes. And then, you can’t take one signal out of context with what happened just before and after. In other words, horses are as individual and unique as humans are. Thanks, Jerri. “Sometimes we think so hard that we can’t breathe….” Guilty. It is amazing at how we forget to breathe…. our thinking brain overrides everything….. Thank you for this, Anna. I think it’s so easy for us to get lost in our heads, especially in times of uncertainty. No part of nature abhors a vacuum quite as much as a human anxiously waiting for a signal from an “other” – whether that be human, equine, or the credit card machine when we’re praying we have enough in our account to cover the groceries. Two things have helped me learn to wait comfortably in that uncertain space: meditation, and teaching therapeutic riding. One of my students had a severe processing delay – at times up to 2 or 3 minutes. Repeating a direction to her would force her to go back to the beginning of the processing – her mother likened it to repeatedly hitting the enter button on your computer keyboard – it just makes the processor cycle back to the beginning (not that I’ve ever done that!🙄). As I learned to be fully present and allow my student to process a request, I gained such joy watching her. While other instructors found her challenging to work with, she quickly became one of my favorites. She taught me far more than I could have imagined and I’m eternally grateful to have had the opportunity to work with her. Penny, thank you so much for this comment. Really great description. Not to take away from your client’s situation; I think many times horses are just the same and most of us have been taught to accelerate cues (ask, tell, make) and the horse shuts down. I’m thinking of the ripple effect… you mention her mother, who no doubt has learned this lesson utterly. And I’m aware of the majority who would not gain from her what you have. She is a gift. And on a personal note to someone who perhaps thinks too much, being Type A has some real advantages. Again, not that I would know, but it’s a blessing, too. You just can’t take it to the barn with you. I hear tell. 🙂 Thanks again. Thanks again Anna for your insightful comments . I have changed my approach to how I interact with my horses due to the use of your methods. I have found that this is somewhat more difficult to hang onto when I ride with others on trails and on endurance rides. There is so much to ‘soak’ on in this most current blog. 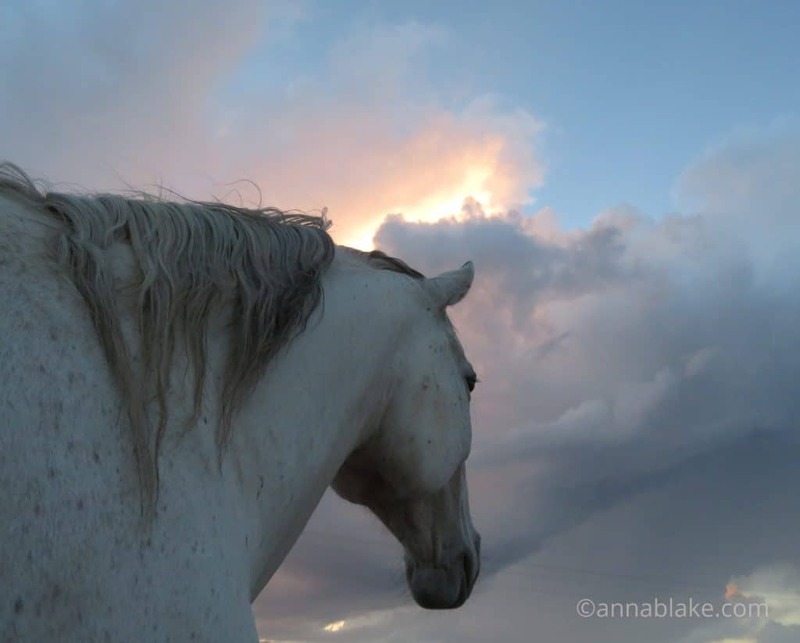 The aspect that is most encouraging to me today is to think of my horse as being “ambivalent.” I always assume when he hesitates or is reluctant to go with me, leaving his friend’s space, that he simply does not want to be with me. .. and then i momentarily despair, because how can I ever be more alluring to him than his beloved herd mate? But it is helpful to acknowledge that perhaps he is ambivalent, torn between wanting to stay in a safe, predictable ‘zone’ versus going along with his human’s requests to leave that, and then providing him space and time to make his choice. My horse Bear is very curious, more so than Cash, and I think what I have to offer him is an opportunity to go beyond the fence line and explore, which he LOVES. So, thank you Anna, much to chew on here…. Oh Sarah!! I do a happy dance, Yes!! This is the perfect example of the ambivalent leading the ambivalent!! And once you recognize it, it’s easy to resolve. You described it so well, in that “momentary despair” he notices, of course. So in the same way that escalating cues is a distraction, so is leaving the conversation. I swear, this is easier to teach live at a clinic, but I’m getting there. Thank you for thinking this through. You are totally getting it. Anna, I have a rescue with an unknown history, and he is the very definition of ambivalence. He often initiates contact with humans, but when they respond in kind, he immediately moves away. Breathing and waiting have been my only successful tools with him, and progress has been painfully slow from my sometimes predatory point of view. He needs to make the choice in order for trust to grow. Thank you for your insights as they reassure me that waiting and breathing are legitimate training aids. These are legitimate training aids and working with so many rescues over the years has really impacted my training methods. Horses like this make you really want to start horses correctly… for just the reason. The horse pays the price forever. Thanks Laurie. Great comment. My trainer – the man who started my horses, received for correction a black pony, reportedly having no mouth, no discipline and all sorts of issues, and definitely had been very badly broken in and was ruined. He saddled it and rode it before the owner had left, so as to give an assessment. “What is this pony’s name?” Turbo. One of many of mine he’d started. When I say started, he only kept them for 2 or 3 weeks, but they’d be all correctly wired up. Two years earlier he had started it for me, and I had worked her well for a year before offering her for sale. Never an issue but they were feisty. Fact was, her mouth was too light for the average rider. He worked with Turbo and put his daughter on her and the owner never could afford the cost of “correction” (little had to be done) and her keep, so left her there. His daughter ended up winning a lot of ribbons on her. Even a well trained youngster is unsuitable for an average rider. A horse ruined in the breaking may be irredeemable. A good horse gone wayward can usually be fixed. Please, all you green horse people, stay away from green horses because it is they who pay the price. Turbo was very lucky. I vowed to cease breeding after that, and subsequently eventually ran out of horses. Great comment Louise. As a trainer, one of my sad jobs has been to tune-up horses for riders and it’s bittersweet to return them to the same riding habits. I won’t limit your comment to green riders as too many long-time riders are just as challenged. Now I prefer to work with horses and riders together; if the rider doesn’t change, I really can’t help with horse much. How many times does a horse change dramatically with each different rider? Thanks, Louise. I never knew what I didn’t know until I knew it. Ambivalent does not mean what I thought it meant! I will add to my self-reminders that giving them a breath and a moment to decide will give them confidence. I am not in general a hurrier, but I hurry too much for a horse at times, regardless. Too goal focused, too much thinking, “you should know this.” There is no should, there is only what is. And another thought I keep telling my busy mind lately, to try to give my horse my full intention (perhaps to banish my ambivalence), “Do what you are doing.” We are so easily distracted, confused, overcome. Stay in the moment. See what becomes. No emotion. Just helping a partner. Great comment, Andrea. That sounds about perfect. What I think it comes down to is that it takes a good horse to make a good rider. Like starting a horse, starting a rider properly is vital. A difficult, hard mouthed argumentative horse is going to create a rider who fights with hard hands. If one learns on a good schoolmaster, like maybe an old show horse, one knows what good is and how it should feel, or they would never know what to aspire to. My other issue is that if you put a beginner up with a rein in each hand, how are they to get their balance? To begin, my reins were put in my left hand, (the right is for the polo mallet, led horse, whip, lassoo etc) my right hand on the pommel for balance, and kept on the lead rein until I could trot. All went out for a ride together. The horses would all neck rein. To this day I still rely on the “bridge”, as it can be shortened efficiently, and prevents the hands (of little kids) from straying. Also learned to bring the free right hand quickly over both for a second grip, in case of a startle or rush. Balance first, then learn to handle the reins. Learning on the lunge is harder. It has just occurred to me that rather than addressing all this ruination, starting riders may be more important. Anyway, its a minefield. Comes with the times, there is more money about than horse-sense. Ride the horse, not his mouth. This one had me laughing as I recalled a recent interaction. I was chatting with one of my barn mates while holding my horse. My friend kept trying to figure out why my horse kept sniffing her hands and nuzzling them. I made some offhand remark that maybe she had put some lavender fragrance on them? When it suddenly occurred to her that what she had actually put on her hands earlier in the day was peppermint-scented hand lotion. Whoever even knew there was such a thing!? I’ve just printed this article and plan to re-read it often. For me, connection has always been the goal – those magic moments and it’s clear that sometimes in “seeking” that connection I’ve actually broken it. Thank you Anna – you have re-inspired me. Thanks, Kathleen. Smiling about how easy it is to scare it away….